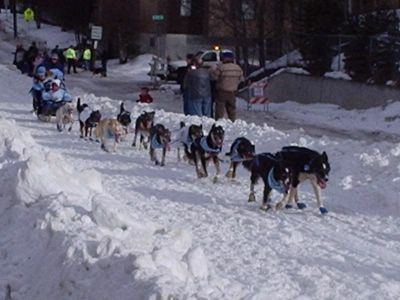 This picture was taken about 1 block from my house of our favorite Iditarod Musher Dee Dee Jonroe. She's a breast cancer survivor about 1 1/2 years ago. She's the woman in the blue mushers hat bent over talking to the woman in her sled basket. People from around the world pay big bucks to ride in that sled from Anchorage to Eagle River. From there to Nome the musher rides alone. Notice the booties on the dogs feet to protect them from the coarse snow. These dogs love to run. Blue bandanas for the team colors. White "T" shirts on two dogs of every team to promote getting your kids immunization shots. There's a link in the right column under the hit counter to Cabelos daily race coverage for those interested. Best of luck to all of the mushers in Iditarod 2005! Newer PostThe mew is mine!